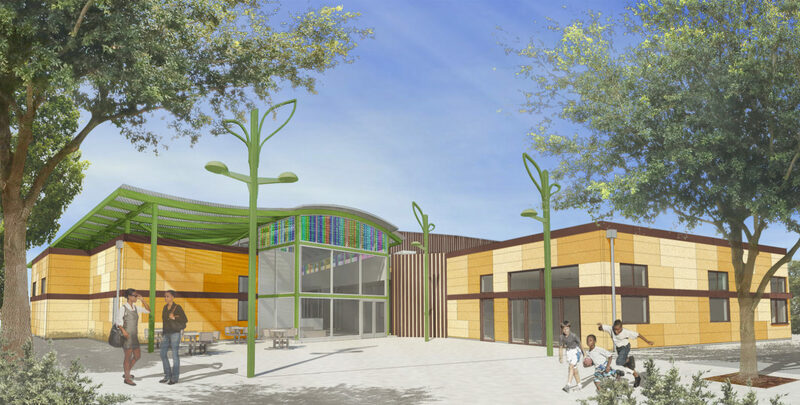 The Rainbow Recreation Center is a colorful remodel and addition to a long-standing member of the East Oakland community. Originally built in the 1970’s, the building has been a center for neighborhood activities for decades; by 2015 it was much in need of modernization. 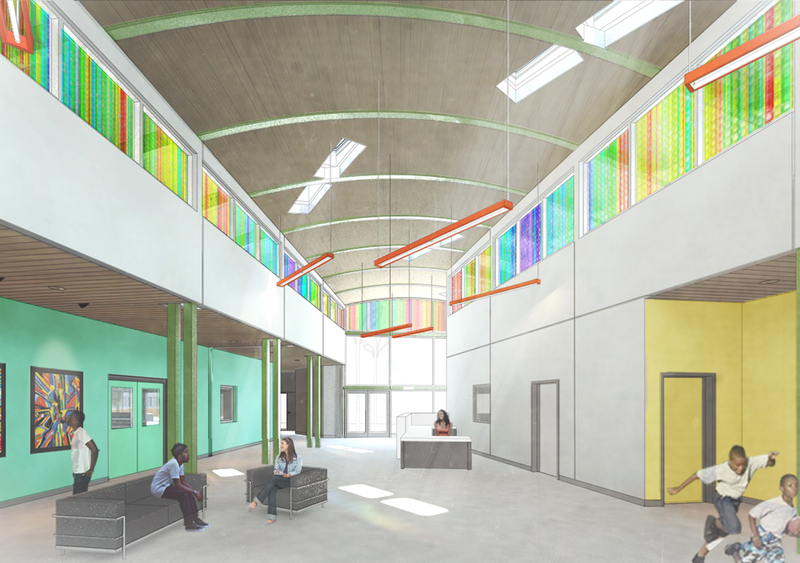 Byrens Kim Design Works sought the input of the East Oakland community throughout the entire design process, hosting numerous meetings and focus groups to generate a design that could truly embody the vision of the people who would use it most. Throughout the on-going collaboration several principles drove the new design: a colorful and inviting facade, a high level of visibility through the building and the park beyond, and an exciting, non-linear form that could become a unique emblem for the area. The final design interweaves these key aspects. The exterior is finished in wood slats and colorful building panels, mixing qualities of modernism and playfulness. A large, open entry courtyard funnels visitors from International Blvd. through a high-vaulted, transparent lobby and into the park beyond. An expressive, curved roof canopy creates a dramatic form that both shelters and emboldens the new building. The scheme’s plan orients the new building to the perpendicular of International Blvd, creating a funnel-like form that aligns to the larger context of the area. The preexisting and renovated gymnasium is wrapped by the new, multi-functional additions. 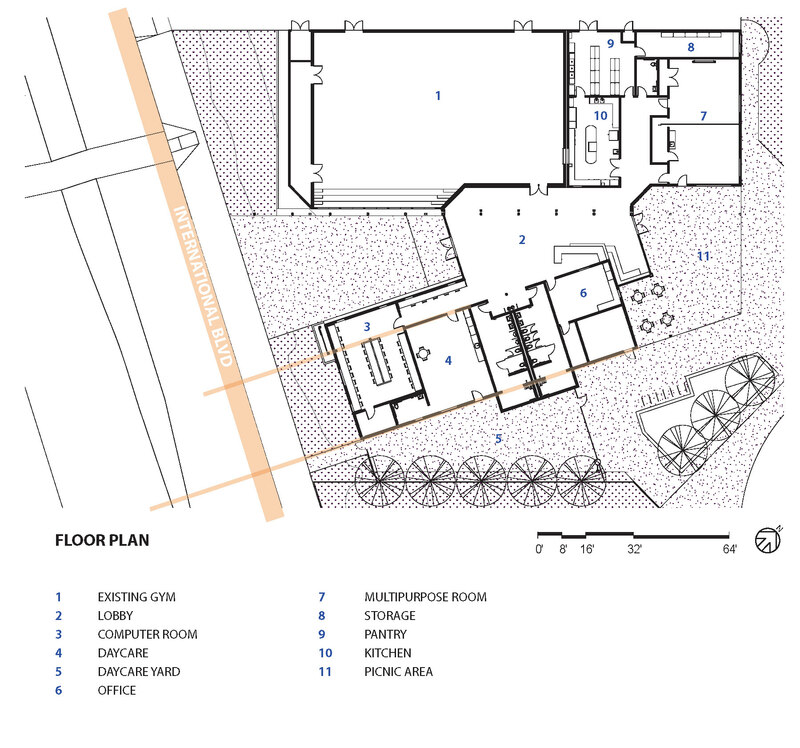 This includes a computer room, daycare, office, pantry, kitchen, and multipurpose room (which opens to the picnic area). The central, double-height lobby acts as additional space for gathering and exhibition. Learn more about Rainbow Recreation Center here.